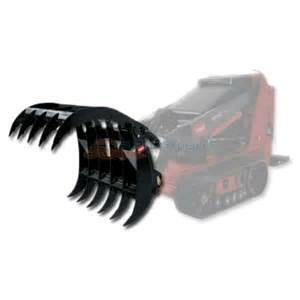 TORO GRAPPLE RAKE ATTACHMENT FOR GRABBING, DRAGGING, LIFTING, AND PLACING MATERIALS WITH EASE. TWO HEAVY-DUTY CYLINDERS CAPABLE OF PRODUCING 3000 POUNDS OF CLAMPING FORCE. * Please call us for any questions on our loader grapple rake 35 inch dingo/bobcat rentals in Portland OR, Gresham OR, Milwaukee OR, and surrounding metro area.